Largest Mammal Award: A Rhino? The trees shake. The gray blurb of a gigantic creature begins to show itself as you step back in fear. What if it charges you and runs you down? The snout is exposed from the forest. It is nearly 20 feet off the ground. The head shows itself and then the massive legs and body. You faint. The above description was not of a dinosaurs but of the largest mammal ever found . 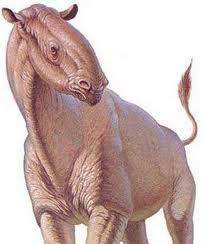 . . the Paraceratherium (or called Indricotherium or Baluchitherium)! Strangely enough, this mammal is considered, by most, to be from the rhinoceros family! The neck of this creature seems to have been very thick, stocky but flexible and mobile. It seems he could easily use it to reach higher or lower food items if he so wished. Hid head was the tool to obtain the food, however. Strangely, this herbivore had some rather large front teeth that were conical and believed to have been used to strip off leaves, with the help of the teeth on the bottom jaw, be sent back by the lips and then to be ground by the molars in the back. All rather strange but amazing.